After all this waiting (as our fans have made abundantly clear, it’s been a long wait) we’re finally releasing EpicDuel Delta.  Sometime on Wednesday, June 29th (what time? 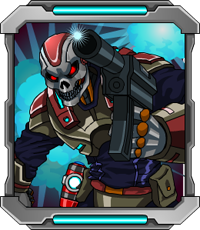 When it’s ready o’clock) we will be rolling live with the next stage of EpicDuel’s evolution! As a special thanks to our players who upgrade during the Delta stage, purchasers of the Epic Varium Package AFTER THE DELTA RELEASE GOES LIVE will receive the Delta Destroyer Weapon Pack! 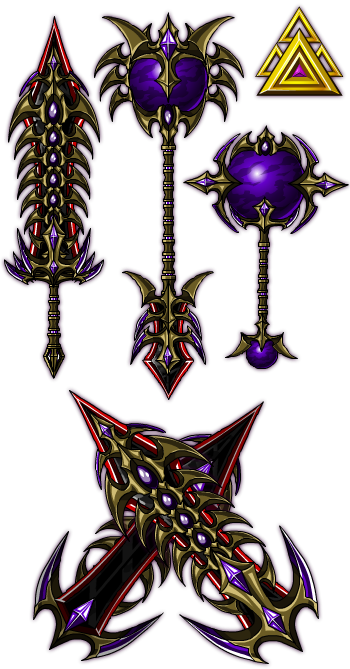 This includes 4 beautiful, rare weapons: the Delta Destroyer itself- which can be used by any class, the piercing Delta Daggers, the crushing Delta Maul, and the powerful Delta Staff. But that's not all! The Delta Destroyer weapons also include an added bonus -- a 13% chance to apply a unique curse effect on an enemy each time the weapon is used. A cursed player is reduced in size and suffers a 20 point reduction in support! Titan isn't used to being the shortest guy in the room! To commemorate this epic new development phase, everybody will be able to go to any Achievement vendor and pick up the FREE Delta Knight Achievement! With the dawn of Delta, it does mean that the Gamma Gear and Gamma achievement will be going rare forever! So grab it before it’s gone for good! We’ve been tirelessly working on balancing the three new classes, shuffling skills around, etc. and you folks are really in for a treat! 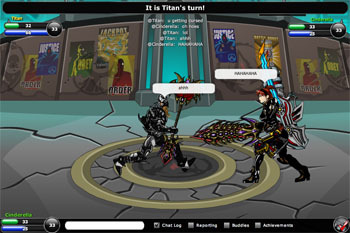 I know that many of you have seen my character page reading “_ Mercenary” (we ended up fixing that bug- go Titan! ), but we have a bigger testing team than ever: Titan, Nightwraith, and Charfade of course, Dorumon, Rainaka, Wiseman, Omni, Ashari, Roshuno, me (Cinderella), and we even managed to steal Randor the Red. I want to take this opportunity to publicly thank everybody who helped us out with testing the Delta release. These new classes should provide the player who loves a challenge with increased variety of skills and builds, and are available from any class change vendor. They will also be able to use the same weapons and armors as the three original classes. Blood Mage is the more aggressive and violent version of the Tech Mage. After being hardened by battle, some of the mages developed a lust for blood, and a balance between magic and melee. As a Blood Mage, you will be able to use the devastating Plasma Cannon, which includes a 25% chance for critical strike and ignores 20% of your opponent’s resistance. Blood Mages will be able to wear Tech Mage armor and use swords or staffs. Cyber Hunter is a technologically advanced hunter. Some members of Baelius’s Shadow Guard started experimenting with the advanced technology available on the main continent, integrating some of that technology into their battle repertoire. 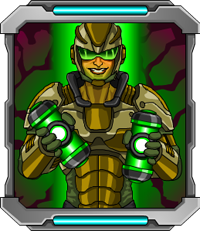 As a Cyber Hunter, you will be able to use the Plasma Grenade, which explodes on contact- injuring your enemy with a 30% chance to stun! Cyber Hunters will be able to wear Bounty Hunter armor and use swords or wristblades. Tactical Mercenary is an intellectual and crafty mercenary who uses tricks to defeat the enemy. When Baelius took over the planet, some of the more intellectual citizens were forced to work in the mines, and were able to create tactical weaponry from the mining tools- such as the Toxic Grenade which has an unblockable Damage Over Time effect. Tactical Mercenaries will be able to wear Mercenary armor and use swords or mauls. To make class changes more accessible for everyone, we have reduced the price of Class Change to 900 VARIUM! We are also introducing a credit-only class change option! By Grabthar's Hammer, what a savings! 2 vs 1 Boss Battles! You asked for it, we built it! This is probably the feature we’re most excited about, honestly, and we’re really proud of what we came up with! Titan’s rigged it up so that you’ll be able to pick your partner from your buddy list. You select your buddy, then click on the icon that looks like a little chain. 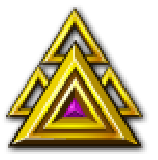 This requests an “Ally Link” with your buddy, which will change the icon next to your buddy from a green dot (indicating online) to a little chain, allowing you to team up for boss battles! Step 1: Select a buddy. If you don't have any buddies, then it's time to socialize! Step 2: Click the link button on your buddy list (it looks like a little chain link)! This will issue an ally request. Step 3: After your buddy accepts, click the challenge button on the NPC. The battle will begin after your ally joins. Note that only certain NPCs can be challenged by 2 players. Step 4: FIGHT! You'll need all the help you can get against this literal monster. The New: Several new faces are showing up in Delta V- or just coming out of hiding. Alydriah Descarl is the beautiful and cold architect of the destruction of Delta V. Her cruelty strikes fear into the hearts of even the most battle hardened soldiers of the Legion. Preferring public executions and flagellation to the soft punishments of the modern age, she earned a place at the head of the Legion. However, her main love is destruction, and her appetite for destruction leads her to fight not only against the surviving exiles, but her own former allies. 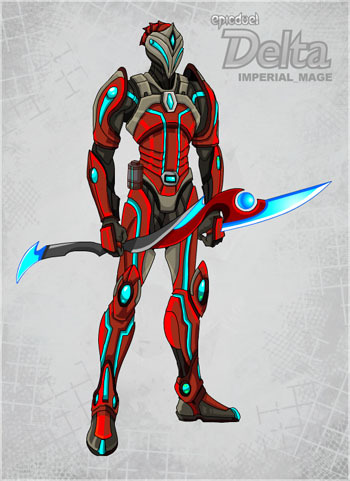 The Imperial Tech Mage is one of Baelius’s creations. The Imperial Tech Mages were an elite force of warrior mages. They were famous for their resilience due to the fact that most of them did not survive the training process. After the Banishment- which imprisoned the vast majority of the population of Delta V between dimensions- some of the Imperial Tech Mages chose to follow Alydriah or Caden. The Improved: Alydriah Descarl is not only a lover of destruction, but a lover of beauty. She’s commissioned the rebuilding of her beloved Fortune City. Players can expect a much more attractive visual experience. As a bit of EpicDuel trivia, here is THE FIRST iteration of Fortune City from the pre-Alpha days. Thank you to all of our dedicated staff and players for make this game what it is. Without your continued support, we wouldn’t be able to keep making the awesome happen. Now back to the test server. Still work to be done! Welcome to summer EpicDuelists! Titan and Artix made it back from E3 safe, refreshed, and inspired! Get the full story on Artix's DN post! 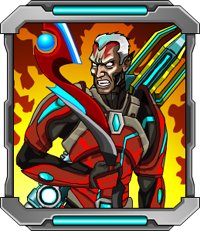 The reason (besides our inability to chain Titan to his desk and pump intravenous caffeine into him... we tried and it did not end well) we haven’t released content is because we’re preparing for the next stage of EpicDuel: Delta! There are so many changes to the database to accomodate for the new classes, that we can't risk an update until we're ready to launch. 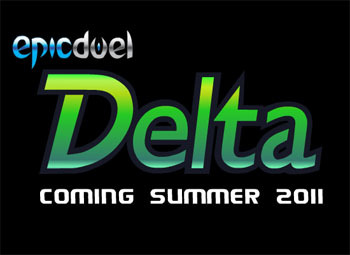 Yes, we are now able to announce a date for the Delta release. 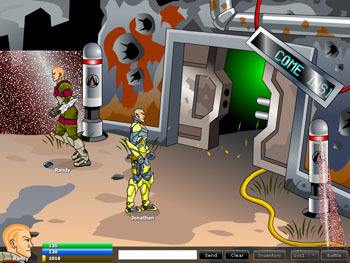 The new version of EpicDuel is tentatively scheduled to release on June 28, 2011. Stay tuned as this date is subject to change. That gives you plenty of time to formulate new builds for the new classes and devise strategies for defeating our toughest boss characters yet! If you’ve visited me in the Biodome, you know that I’m a scientist, and this new evolution of EpicDuel is exciting for me. 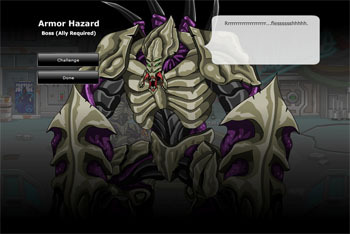 See, in science the Greek letter Δ means “change”- and EpicDuel is evolving. This means new areas, new stuff, new faces, new ways to collaborate, and new ways to affect and tell the story of Delta V. This also means that the Gamma Gear (bot, bike, cheevo) will be going permanently rare! Delta also means "fourth in a series." Alpha, Beta, Gamma, Delta? Works for me! Last week, we introduced you to our Delta classes. We're still not quite sure how the class change process will work with these new classes, but we do know that we want to make it as fair and easy as posible to try these awesome new classes. This week, as we feverishly continue to build everything necessary for more than 3 classes to work, we will be introducing you to 3 of the new skills you'll be able to use. For the Tactical Mercenaries (we changed the name to maintain the theme of the other two classes), you’ll be able to use a skill called Frenzy. By using this lethal new attack, you’ll be able to crush your opponent, as well as taking some of their health for your own! Cyber Hunters will be able to experiment with the new Plasma Grenade, an energy-based attack that has a chance to stun your opponent! Blood Mages will be able to break through their opponents’ defenses with the Plasma Cannon, an awesome weapon that launches a stream of concentrated energy at your opponents. So what we’re trying to say here is, it’s gonna be pretty awesome. You’ve already heard the story about the violent and calculating Alydriah Descarl, so I don’t need to reintroduce her to you. Today, I would like to introduce to you the Imperial Tech Mage. Years before the rebellion on Delta V, Baelius ordered the formation of an elite group of Tech Mages who could enforce his will across his empire. The technology used to create these psychic assassins was still fairly new, so the dangerous process caused many volunteers to die before they could even be trained. Those that survived were very unstable, violent, ruthless, and intensely loyal to the Baelius. After the incident that banished 80% of Delta V's population to a prison between dimensions, the Imperial Mages grew restless. Without new orders from Baelius, some chose to serve his underlings, such as Alydriah and Caden. Their specialized training made them ideal templates for Blood Mages, a battle-hardened and brutal form of Tech Mage. METROCON: This one is held at the Tampa Convention Center in Tampa, Florida, June 17-19. AE will have a panel at 2:00 PM on Saturday in PANEL ROOM 13-14. Apparently the Artix gets overly excited about merch, so if you see a grown man dressed as a Paladin loaded down with shopping bags, it might not be Artix but there’s at least a decent chance he will be. P.S. Thyton LOVES it when you tell him MechQuest is too hard. Hi folks! This might be a disappointing week for you guys, so I apologize in advance. 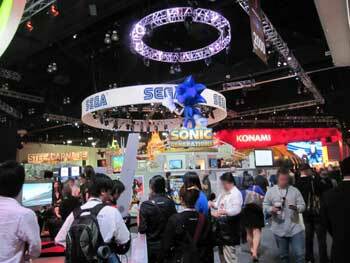 As you know, Titan and Artix are currently at E3, the huge trade show for electronic and video game developers. While this is awesome for us, and double awesome for Titan and Artix (maybe they’ll get some awesome ideas for new games! 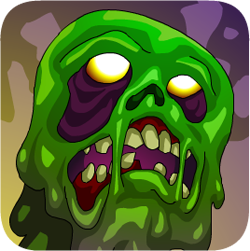 ), it also means that there’s no update for EpicDuel this week. Now, just because we have nothing going into the game this week doesn’t mean we’re taking the week off! 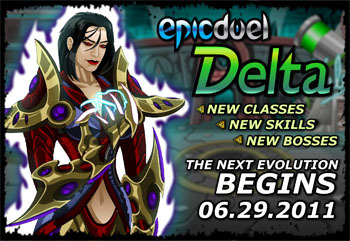 We’d like to take this opportunity to show you what we’re working on for the next phase of EpicDuel: Delta! Cruel even by the standards of the Shadow Guard, Alydriah Descarl’s name strikes fear into the hearts of even the most battle-hardened of Baelius’s soldiers. She was responsible for the incineration of the mining camps south of Jumerna, as well as many of the dissenting miners in the continent’s mineral-rich “Varium Ring”. Believing that the old ways are the best, she prefers flagellation, the stocks, and ultimately public executions to the soft, civilized punishments of the modern era. This blood thirst earned her a spot at the head of the Legion, however her desire for blood and order at all costs pits her against not only the Rebellion- spearheaded by Oz- but against Baelius himself. It seems the recent chaos has presented the perfect opportunity for her to make the next move. 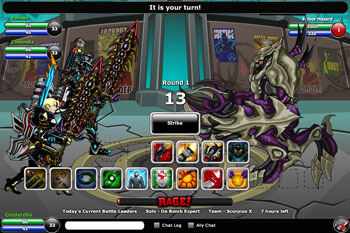 You can read more about Alydriah and the Shadow Guard on the BattleOn Forums. Descarl is not only a lover of destruction, but a lover of beauty, and by her command, her beloved Fortune City is being restored to its former glory. Expect a revamp of the Fortune City artwork soon! PARIAHCON: This convention (Lakeland, FL’s first anime/gaming/collectible convention) will be held at the Imperial Swan Hotel and Suites in Lakeland, Florida on June 10th and 11th. Artix, Nythera, Thyton, Jemini, Korin, Cysero and other members of the AE staff will be there (in Artists’ Alley as well as manning a booth) and will be holding a panel Friday at 4:00 PM in the Main Events room on the 7th floor. Since this will be a small, intimate, convention you’ll have more of an opportunity to have fun with AE staff! METROCON: This one is held at the Tampa Convention Center in Tampa, Florida, June 17-19. AE will have a panel at 2:00 PM on Saturday. Apparently the Boss Man gets overly excited about merch, so if you see a grown man dressed as a Paladin loaded down with shopping bags, it might not be Artix but there’s at least a decent chance he will be. DRAGONCON: This one isn’t until September, but as always, DragonCon is a Big Deal, like 80,000 attendees big. It’s held the first weekend of September- this year it’s September 2-5- in Atlanta, GA. AE has a panel, and attendees who come to see us will be able to get the sweet, rare items that could include a signed banana, random anime videos, or exclusive in-game rares! I love my little Steampunk dragon from last year- who knows what kind of awesome things you can pick up this year?